On the last full day of TechEd, you can tell that everyone is a bit delirious from a long, crazy week in this final live podcast. We got to talk to John Astill about his demo jam experience, Rui Nogueira about code exchange, and then Tony de Thomasis decided to grace us with a special video that caused quite a scene. Enjoy. On Day 2, we sat down with SAP CIO Oliver Bussmann to discuss the strategy, joys, and pressures of supporting the SAP IT infrastructure as well as setting the example to others as an SAP Customer. 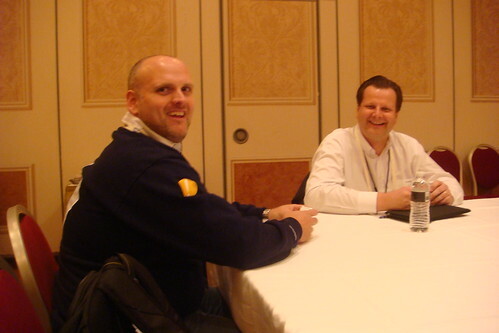 Mr. Bussmann is also active on Twitter, so you can check him out as @sapcio. “Bussmann has a proven track record in his career spanning nearly 20 years in IT management. Most recently, he was regional CIO of Allianz for North America and Mexico (NAFTA). His prior roles include positions in the Allianz Group in Germany and the United States, as well as at Deutsche Bank. He began his career at IBM in Frankfurt, Germany, where he was responsible for the retail banking division. We had another great turnout for our day 2, live podcast recording. In this episode, we had the pleasure of interviewing demo jam winners and fellow egheads Matt Harding and Al Templeton. Matt and Al talk about the technical details as well as the overall experience. 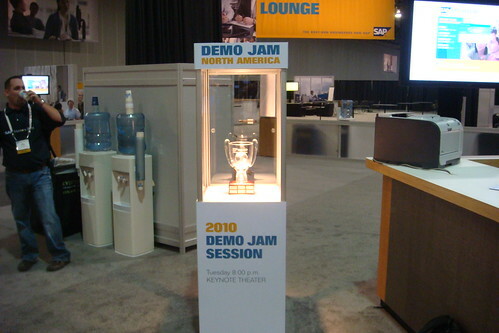 They seem to have let the victory get to their heads a little as they decide to throw down a personal challenge to both Ed and Thomas for a demo jam showdown in next years Mastering SAP Technologies event in Australia. Watch the replay of their demo here. On day 1 of SAP TechEd in Las Vegas, we were able to sit down and spend a few minutes with SAP CTO and Executive Board member Vishal Sikka for an exclusive eGeeks interview. Vishal explains in more detail some of his topics from the keynote and answers some other questions from the egheads. “Dr. Vishal Sikka has been a member of the Executive Board leading the Technology and Innovation Platform area since February 2010. Check out this video of the enterpriseGeeks talking on SAP TechEd Live about the future of ABAP. We discuss a little bit about the current state of ABAP and what we think we will see in the coming years. There was a great turnout on Day 1 to the eGeeks live podcast taping. During the session, we had the opportunity to discuss Vishal Sikka’s keynote with feedback from the egheads. With both Tom and Craig in action, we cover all sorts of session topics, virtual SAP TechEd, Demo Jam, Innovation Weekend, iPad goodness just for Ed and so much more.